New York, NY – (November 12, 2018): United Thinkers, a New-York based commercial open-source Payment Management Software provider has published a guide on fundamentals of payment processing for different categories of merchant services industry players, such as merchants, payment facilitators, independent sales organizations, and payment service providers. United Thinkers published a free guide providing tips for those who want to organize payment processing for their companies, including businesses that are already working within the industry or only entering it. The guide provides useful tips that all payment industry players should be familiar with, in order to know how to optimize their operations with respective payment processors. Each section of the document includes specific targeted recommendations based on United Thinkers extensive experience of working in the industry. Company specialists routinely help different categories of businesses to establish successful gateway and acquiring partnerships, become white-label and full-fledged payment facilitators, implement EMV payment terminal solutions, replace legacy payment platforms, and improve the terms of their processing relationships. United Thinkers has been helping companies to smoothly go through PCI audits, EMV certifications, and integrations with banks and processors, for many years now. Moreover, UniPay Gateway payment management platform has become a proving ground for several innovative concepts, such as EMV payment terminal cloud, collaborative payment processing, white-label payment facilitation, and a number of recurring billing solutions. Presently, UniPay Gateway partners and users include some of the major payment platforms and processors. The guide on fundamentals of payment processing reflects most of the listed key aspects of the company’s experience. The document consists of several sections, each listing the common needs of particular merchant services industry player categories, problems and challenges they face, recommendations they should follow, and steps they should take to make the most of their processing partnerships. While some recommendations are common for almost all categories of businesses listed in the document (for example, such aspects as support of target MCC, currencies, and geographies, are relevant for merchants, ISOs, PayFacs, and PSPs), others are category-specific. The guide text is available for free download here: Fundamentals of Payment Processing. The appeal of the UniPay Platform is the open-source nature, affordable cost, robust omni-channel feature set, as well as the advanced APIs and wide variety of Code Samples for easy integrations. 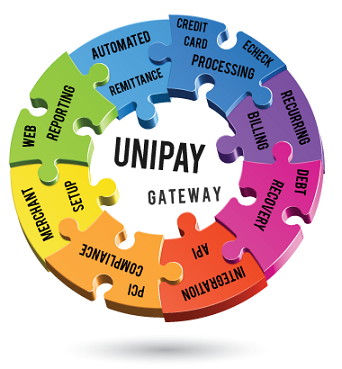 Which bank or processor does UniPay gateway use to process electronic payments?